Private spacecraft maker SpaceX has announced plans to show off its latest collaboration with NASA: a space-worthy vehicle that can deliver astronauts from Earth to a space station and safely back home. 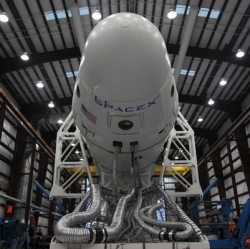 The Dragon Mk 2 spacecraft will be revealed on Thursday, May 29, Elon Musk, SpaceX’s chief executive. “Actual flight design hardware of crew Dragon, not a mockup,” wrote Musk, who is also co-founder and chief executive of Tesla. The new Dragon model should be a big improvement over the original one, which carried more than 800 pounds of cargo to the International Space Station in October 2012, not least because it will be suitable for handling human beings.